I had decided that when the weather got warmer I would start riding my bicycle to work. It’s not very far, only about five miles. And not too hilly either, just one steep hill to climb and that’s on the way back home. I will admit that I was a little nervous about doing it, the roads are narrow, sometimes no shoulders and the drivers, well sometimes I get a little nervous. But the weather is beautiful, the scenery is beautiful and I could use the exercise twice a day. I thought it would be fun to use a bike bought locally so I went to Cainz Home Improvement Store and purchased one. Even though the one I purchased had 27 inch tires the frame was a little short so I bought and extra long seat post to raise the seat a little and it helped some. Bobbie and I cruised the neighborhoods trying it out. She was already a pro since she had purchased one like it (but a 26 inch) when we first arrived. So with new bike in hand I set out on my first ride to work. 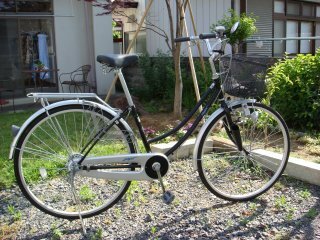 I soon discovered that Japan is a very bicycle friendly country. The drivers seem to consider someone on a bike as another driver. They will yield to me at intersections and narrow roads. No horn blowing or angry drivers. There is one narrow bridge I have to cross. I learned that if I move to the center of the lane the traffic will queue right behind me and patiently follow me across. Once across the cars pass me and without yelling or horns or aggravated looks. I arrived at work that first day to the amusement of everyone. The guards laughed and pointed and commented about my chari (slang), its how young people refer to their bicycles. Many of my coworkers asked why I would do such a thing, to which I replied, “To save the planet” in reference to the explanation we hear when we ask why is Japanese garbage collection so confusing. On the ride home that first day I approached the steep hill with some trepidation. 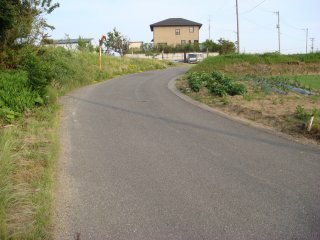 I began the ascent slowly and as I made my way up the hill I began to regret having a single speed. About a third of the way up the hill I rose out of the seat becoming fully upright and peddled. As I rose 50 years peeled away and I felt the way I did at six years of age riding my Western Flyer to grandma’s house in the hills of Virginia. As I crested the hill and seated myself I swear I could hear those bubble gum cards rubbing the spokes. Foot note: These old bones can only take so much "youth". I have relented and I have been riding my 27 speed, Specialized mountain bike to work. It's way more comfortable. Click the photo to see how it's equipped.